Our ShadeSlider™ skylight, door & bottom-up shade motor kit is also now available. It's good for blackout blinds too. We have intruduced a new 'Solar Wireless' series of blind motors with built-in rechargeable batteries and optional solar panel. Enjoy a completely wireless installation and still use our radio remote controls! These are also available in our mini size battery shade motors. We Have "Future Proofed" our RollerTrol Blind and Shade Products! Don't like complicated systems? You can start with our very simple radio controlled motors and hand held remotes, with the assurance that your system can be expanded to meet any future needs. They are very simple to install and operate, and many of our customers find that it's all they need! We have implemented a full zwave interface system; for more info, please see this website about our Z-Wave controller. Controlling your blinds with a PC can be convenient, but what if you could control everything with tablets placed (or wall mounted) at strategic locations around the house? What if you could control devices with your phone too? What if you could do this from remote locations when you are away? We too have had the experience of using multiple remote controls in our living room. Our RollerTrol™ system has been designed from the ground up to eliminate this problem. The ability to interface our motors with the Vera™ web server (or any device with a USB port) takes you one giant step forward to having a single, unified control system for all your devices. That's is what the Vera™ and Veralite™ web servers are all about. Essentially, they are specialized 'mini computers in a box' that connect to the wifi or DSL/cable modem in your home. They act as web servers for controlling your home devices, and the beauty of this approach is that all communications and control with Vera™ are handled via the browser on any internet enabled device! Use PC's, Android™ tablets, Mac™ computers, Linux computers, iPhone™, iPad™ and any other web enabled device! For more info, please see this article about using Vera™ to control shade and blind motors. Here's an unobtrusive 12 volt electric window opener for controlling windows, skylights, vents, and any other item you would like to move with a motorized actuator. It can be controlled by a simple switch, or with our optional remote controls. The linear chain actuator pushes straight out from the fixed housing which lines up unobtrusively with your window frame, fastened in place with mounting screws. 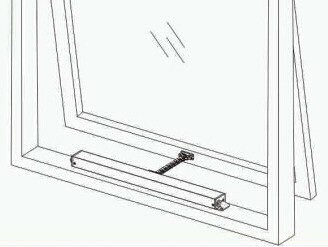 Attach the end of the chain actuator to the window with two screws and you're done! You can also use it with our Z-Wave controller. You've seen how handy our window blind and shade systems are, now you can use the same safe, low voltage technology to open and close your windows. 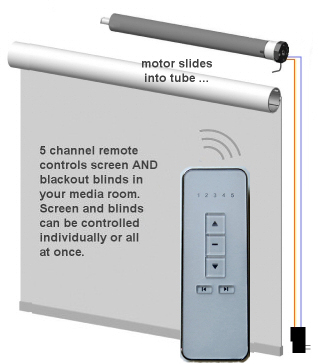 With our new RollerNode™ controller, you can use the same radio remote system that controls our blinds. This means you can also later extend your system to use your phone, tablet or PC (any web enabled device) to control your window openers. It is simple to adapt this unit to most types of windows and skylights because it does not need to rotate in any way like hinged units do. The flex link direct push drive has a 300mm stroke (~12"), the opening/closing force is approximately 20 lbs (9 kg﻿), current consumption is ~1.5 A. Use it to control the motion of windows, greenhouse vents, skylights, etc. 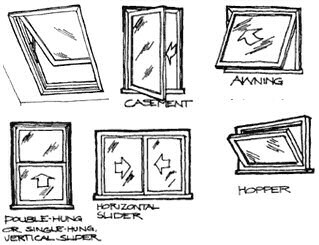 It can be adapted to work with most types of windows: single hung, double hung, hinged casement, skylights, etc. The internal electronics provide travel limit stops and motor overload cutoff. We sincerely hope you enjoy using these advanced products; if you have any questions, please feel free to contact us at any time!